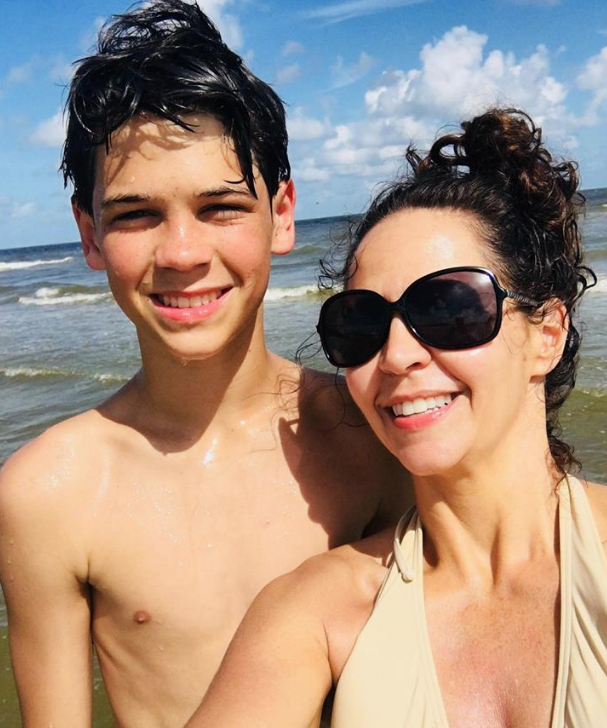 And since I’m not a huge fan of the beach, a weekend getaway to Galveston is really all we needed. 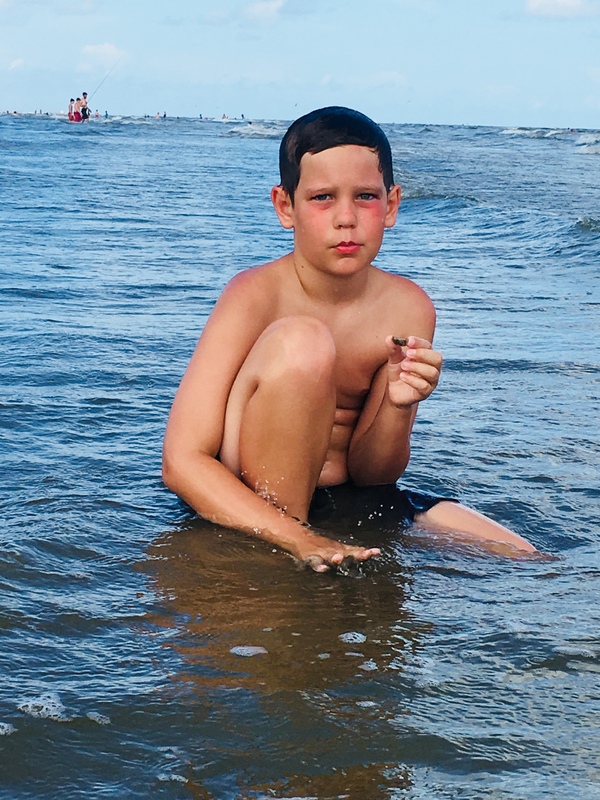 But if you plan to stay longer, Galveston has plenty of fun things to do besides lay around on the beach…in gritty sand…letting it get all up in your nether regions. Did I mention I don’t love the beach??? You’ll find all plenty of major chain hotels on Seawall Blvd. 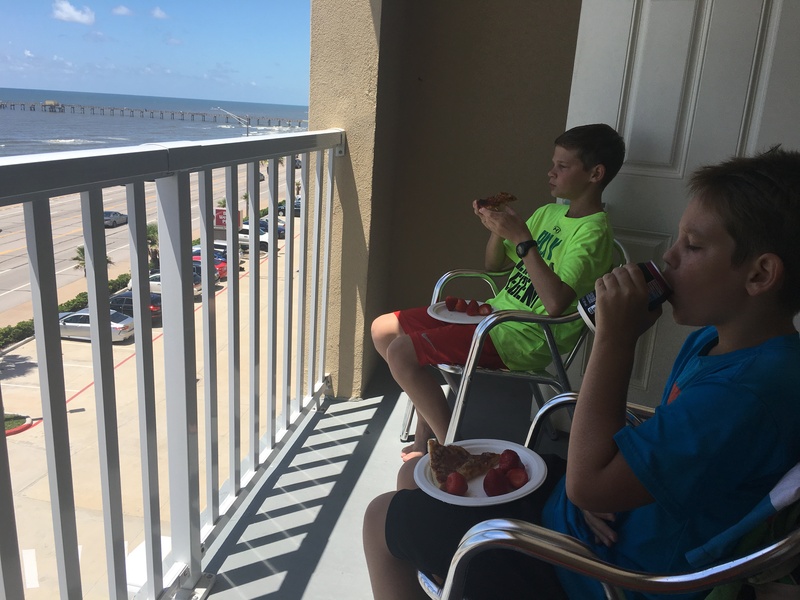 We stayed at the Best Western Galveston Suites because it’s a new hotel (built in 2016), is down a ways from the busier part of Seawall Blvd., and most importantly offers a full, hot breakfast with sausage, eggs, biscuits and gravy…and of course, making those Texas-shaped pancakes was the highlight each morning for my boys. ***Here’s a tip when booking any hotel room: Always request a corner room. You’ll usually find corner rooms offer a little more space than all the other long and narrow rooms. And since we’re a family of five, we need all the space we can get! 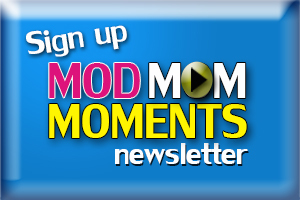 And be sure to go through Ebates or TopCashback when booking online. Collect that FREE money, baby! 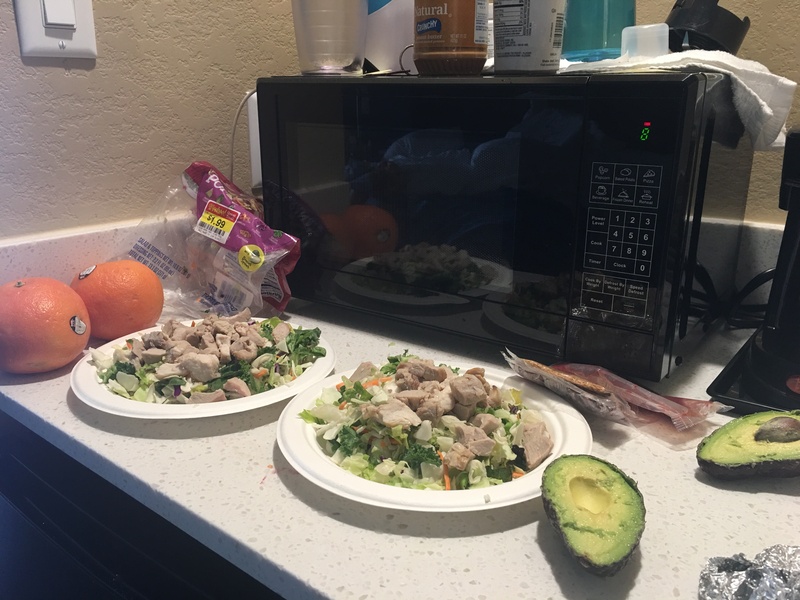 And because we had a mini-fridge in our room, before we left home I packed a cooler full of easy things for lunch: leftover pizza, salads, grilled chicken, PB&J, etc., which meant we never spent any money eating out at lunchtime. Check out this awesome cheap lunch with a view! The week before we left for our trip, Kroger had a One-Day 70% off Summer Flash Sale. 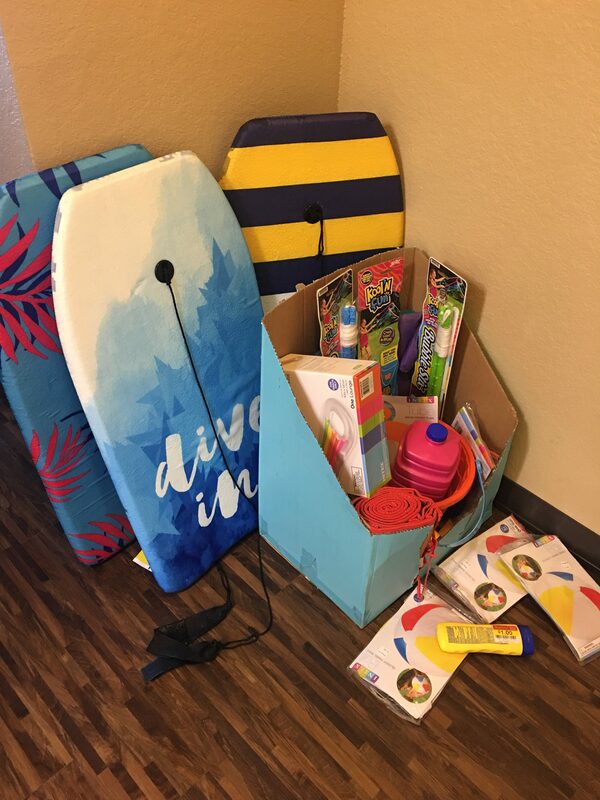 I scored floats and tubes for just $1, beach balls for $.30 and buckets and bubbles for $1. And Five and Below had boogie boards for only $5. Don’t worry if you forget to pack something. On Seawall Blvd, you’ll find Walmart and Kroger. But be prepared to enter with lots of patience because they’re both crazy busy all the time. Most popular hotels are on Galveston’s Seawall Blvd. But I think that’s the worst place to be if you want a true, sandy beach experience. Keep in mind, there is a nice area in front of the convention center, but it’s usually very crowded. If you’re lucky enough to find a place to park (and you’re good at parallel parking with the added pressure of cars coming at you from both directions!) there is Seawall Paid Parking available. Want a more peaceful beach experience? You might consider traveling a few miles west on Seawall Blvd. to Galveston Island State Park. 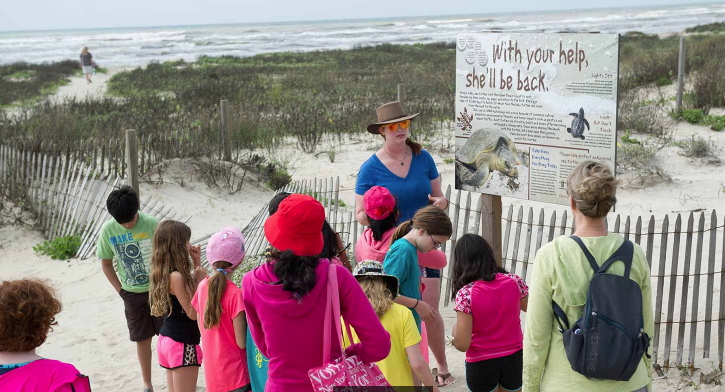 It has over 2,000 acres of surf, beach, dunes, coastal prairie, fresh-water ponds, wetlands, bayous and bay shoreline. And a bonus, on Saturdays at 10am, they even offer FREE guided beach and bay explorations tours. 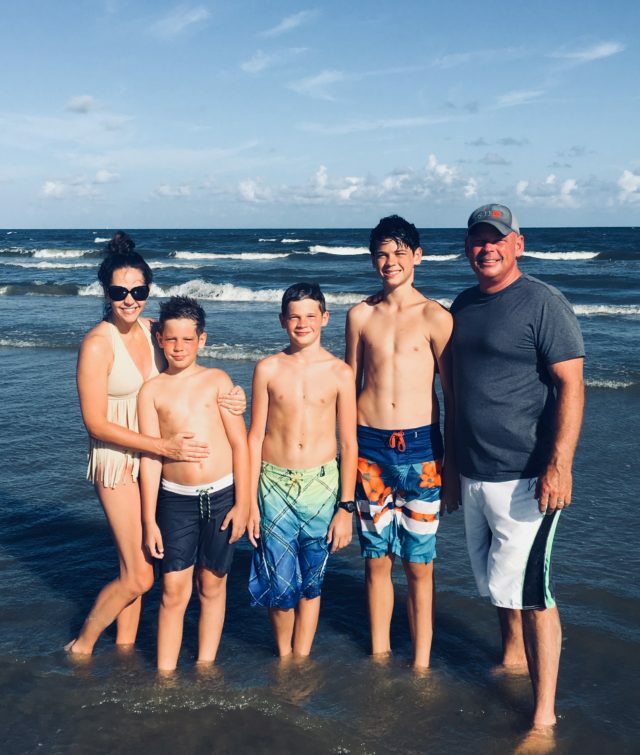 ***Insiders Tip: My sister-in-law who lives in Houston and has visited the Galveston Island for many years, took us to a little, hidden gem. It’s the entrance for Holiday Inn Club Vacations, but it also has beach access. What’s great about this location is there’s a restaurant called the “Tipsy Turtle” with bathrooms & showers available when nature calls. But don’t go trying to find it on Google Maps…it’s not there. Here’s the exact pinpoint location on Google Maps. Cost: Well, it’s supposedly $15 per car. But no one was inside the booth and the sign was put away…so FREE parking for us, yea! What to do in Galveston besides going to the beach??? 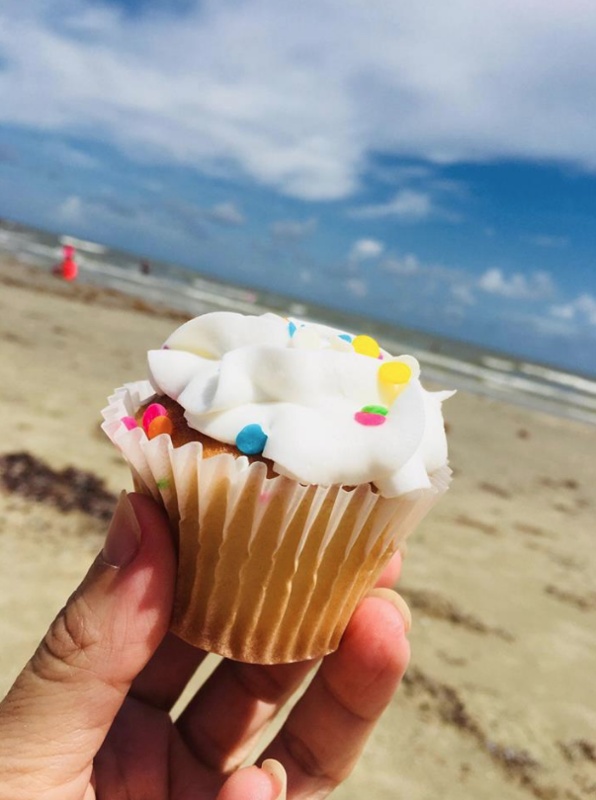 Below are 3 FREE Things to Do in Galveston, TX. 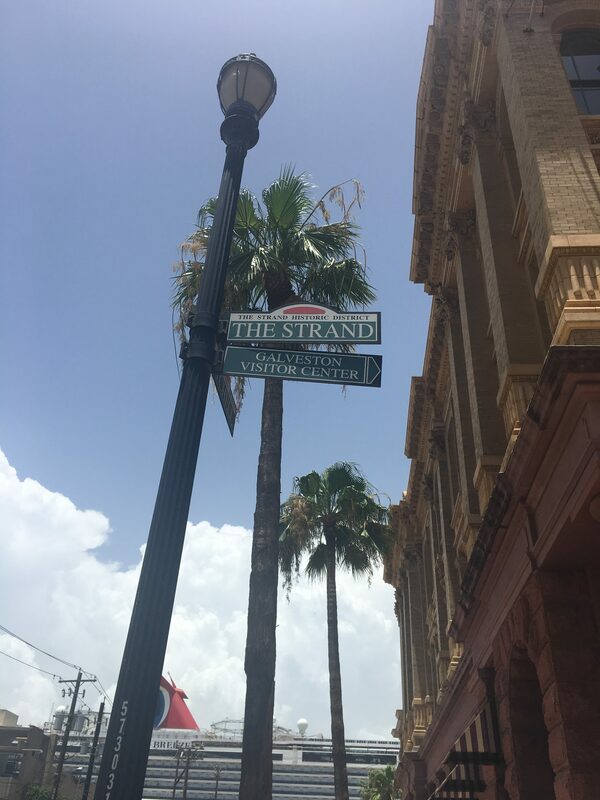 The Strand is a strip of busy shops and restaurants in the historic downtown area of Galveston. 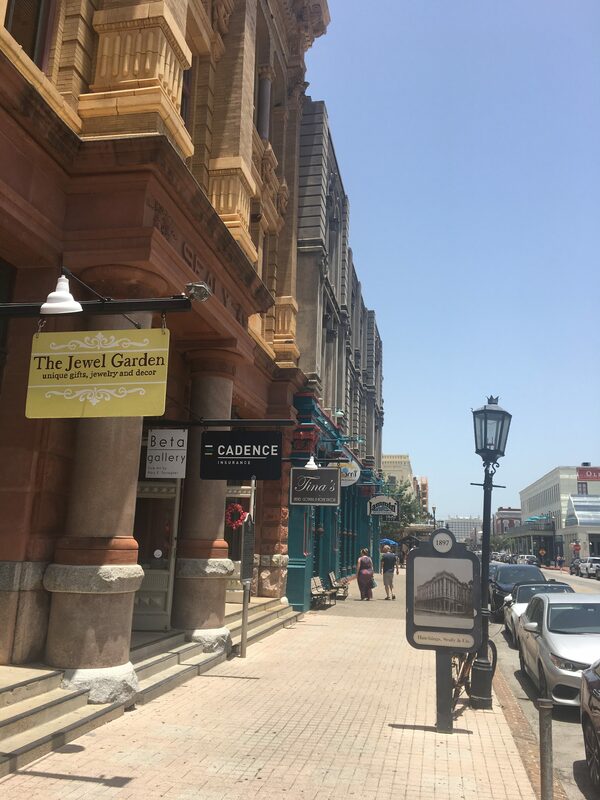 In the late 1800’s, this five-block business district was know as the “Wall Street of the Southwest” because most goods and people came through Galveston harbor in order to get access to the rest of Texas. Quick Fact: In 1881, $38 million worth of merchandise and services were sold through the various establishments in the district. 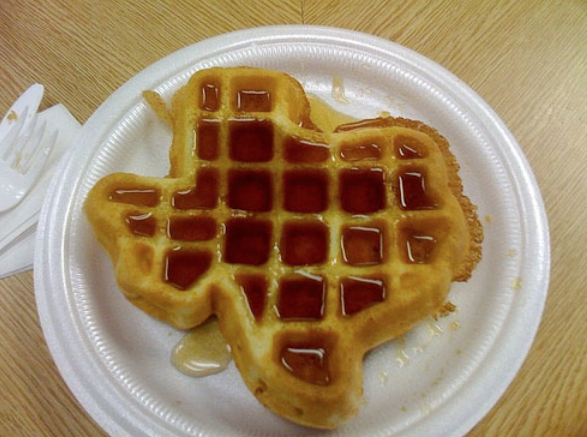 The five largest banks in Texas were located here. 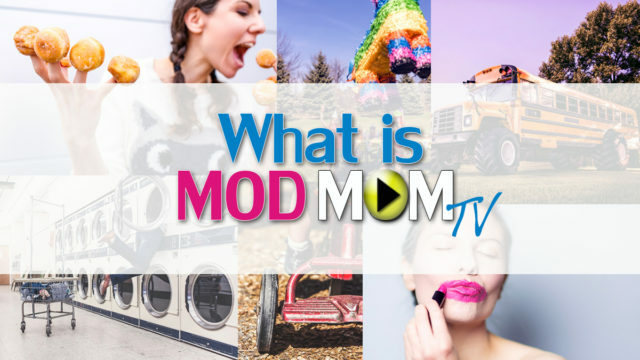 Do you notice that Carnival Cruise ship in the background??? 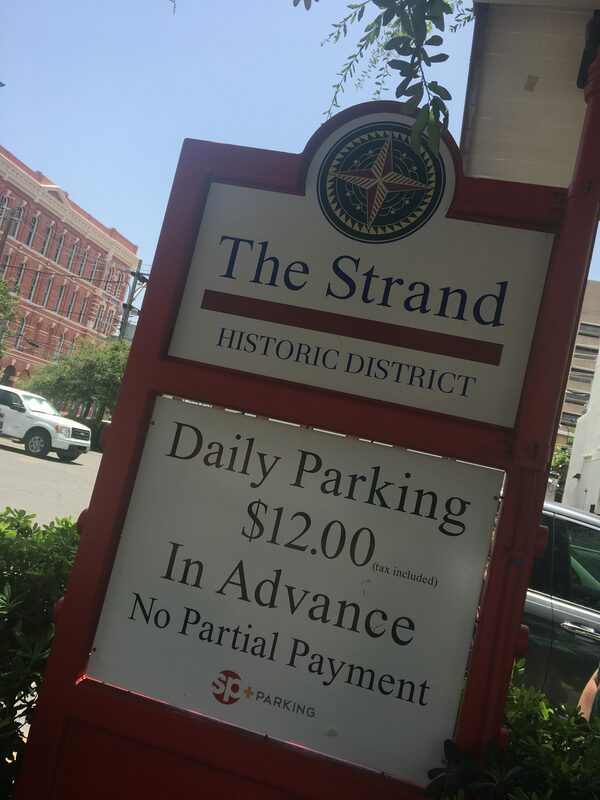 That’s because the Port of Galveston is directly across from The Strand…which means if you’re leaving on a cruise, plan some extra time to stroll The Strand. If you’re NOT taking a cruise, check this Galveston cruise ship schedule and avoid The Strand at these time! The Strand has beautiful Victorian and Greek Revival architecture you can check out as you walk from one store and gallery to another. 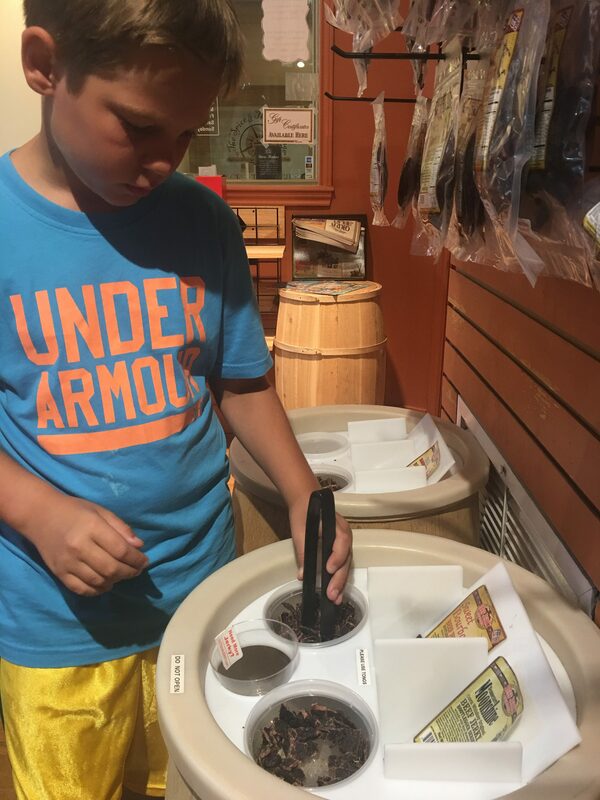 Make sure to stop by LaKing’s Confectionary, an old-fashioned candy shop where you can watch saltwater taffy being made. 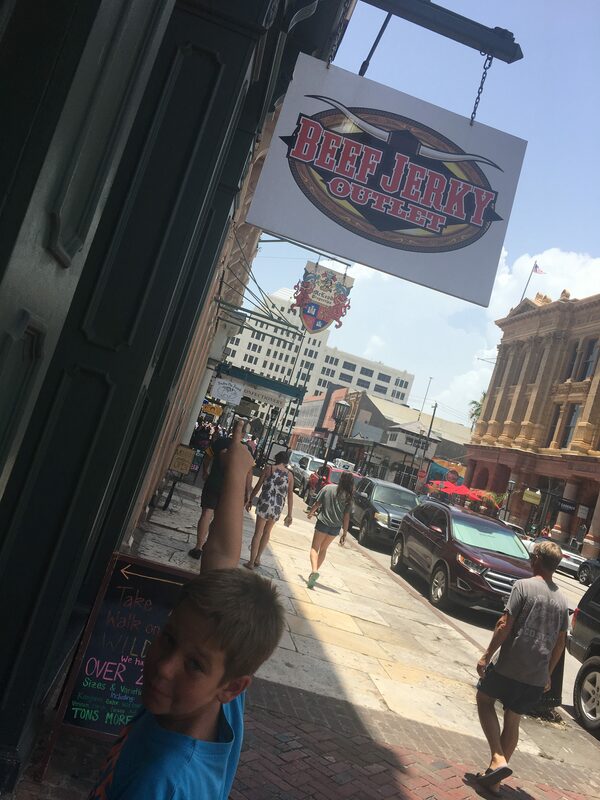 ***Insider Tip: If you have hypoglycemia like me and find yourself getting “hangry” at 1pm because you haven’t had lunch, swing by the Beef Jerky Outlet and grab some FREE samples! Yea, for protein!!! 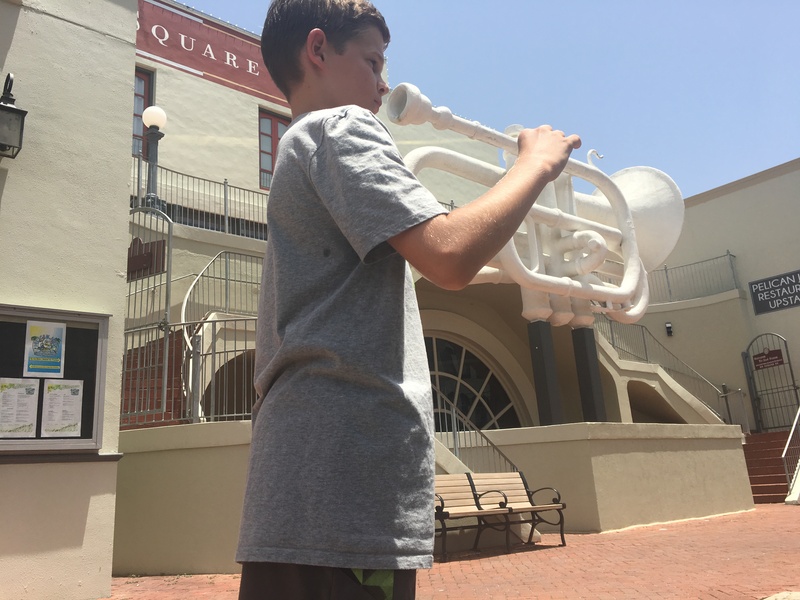 Austin, our trumpet player, was excited to discover this giant white trumpet/cornet sculpture just south from Tremont on 23rd street and The Strand, beside the Old Galveston Square building in downtown Galveston. Cost to Stroll The Strand: FREE…as long as you can refrain from dropping a load of cash on food and souvenirs! 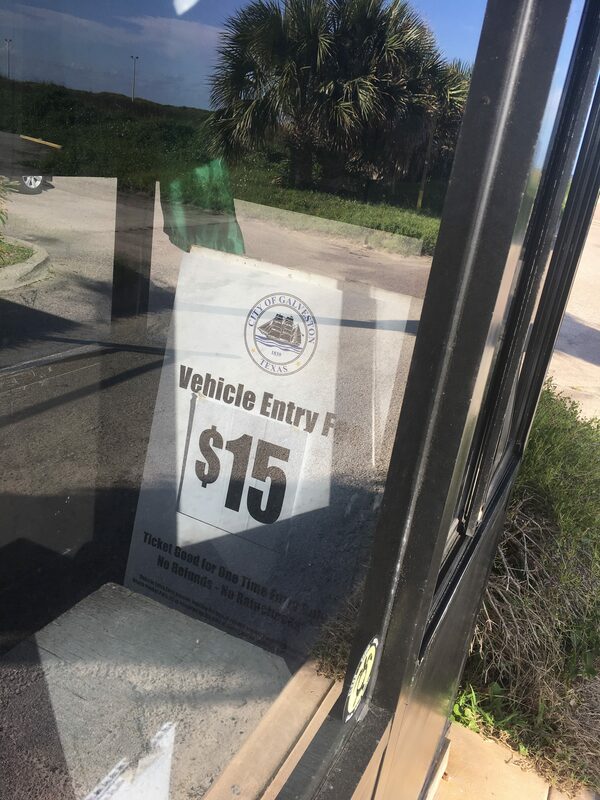 And instead of paying $12 to park, drive around and look for FREE public parking. We went on a Sunday afternoon and easily found FREE parking on 20th Street. 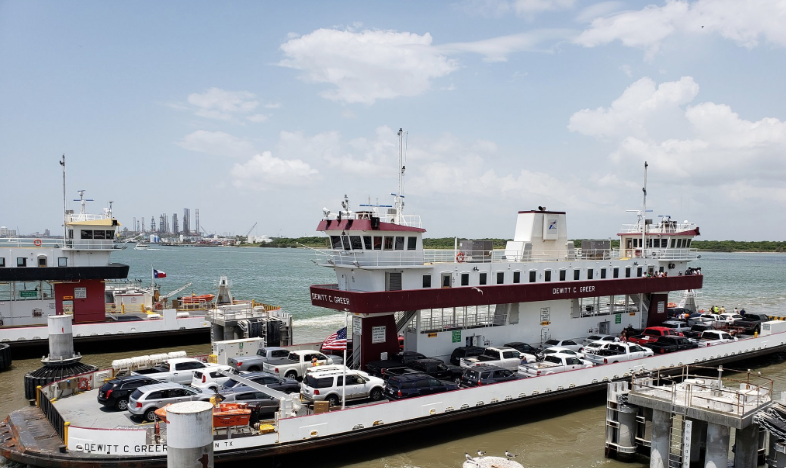 You can cross one of the busiest waterways in the world on the Galveston-Port Bolivar ferry. This 2.7 mile trip takes about 20 minutes each way. 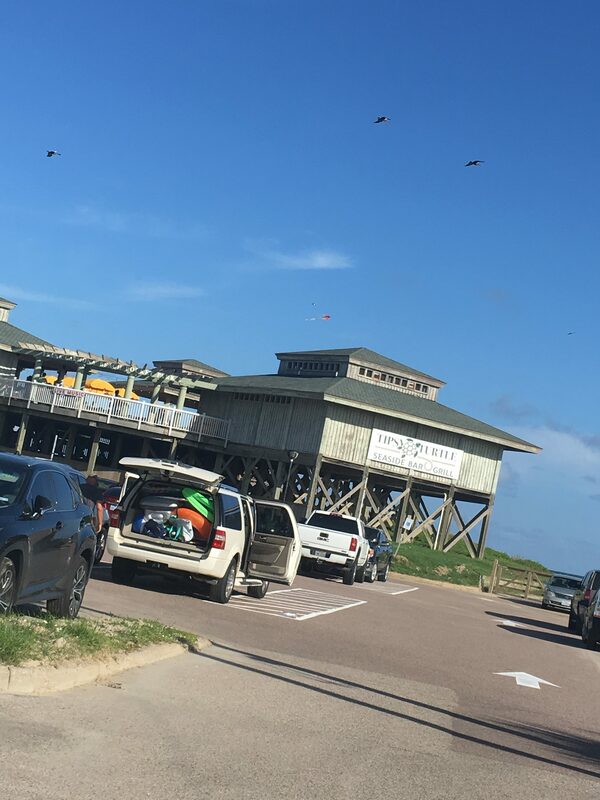 Be sure to bring crackers (or leftover biscuits from your hotel breakfast) to feed the seagulls off the back…and you may even see dolphins! When life gives you a hurricane, make tree sculptures! In 2008, Hurricane Ike destroyed and uprooted thousands of trees, causing Galveston to lose much of its beautiful tree canopy. But some homeowners chose to turn their damaged trees into art instead of mulch. 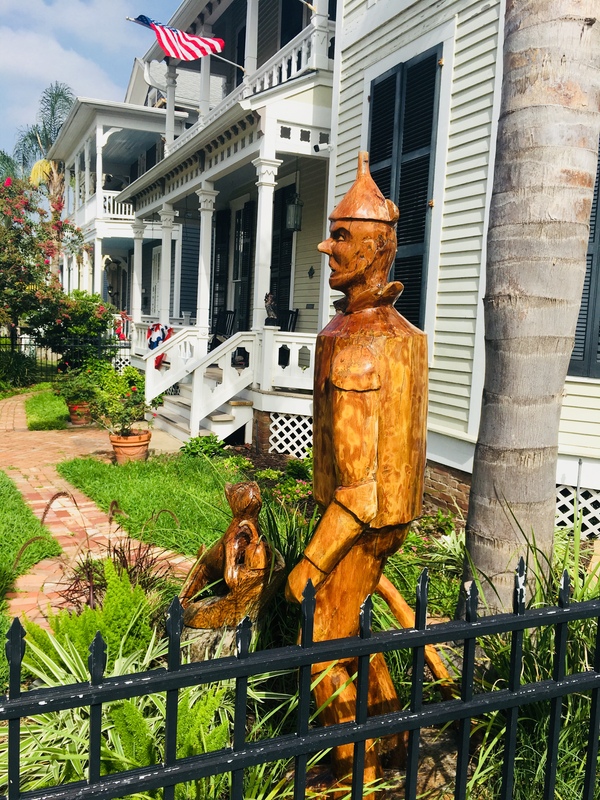 We spent about 30 minutes driving the FREE GalvestonTree Sculpture Tour the morning we were heading out of town. 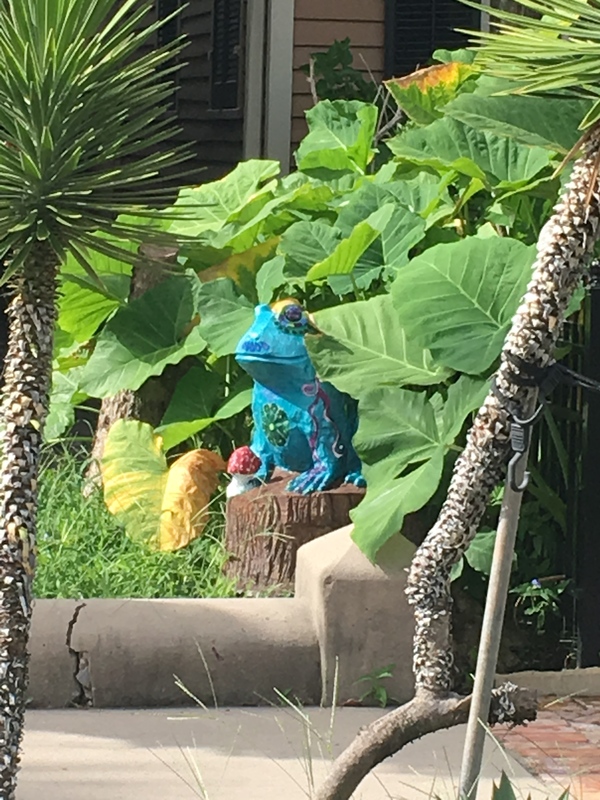 It was a fun, little scavenger hunt as we searched up and down the streets trying to find which historic home housed one of these unique pieces of art in their yards. 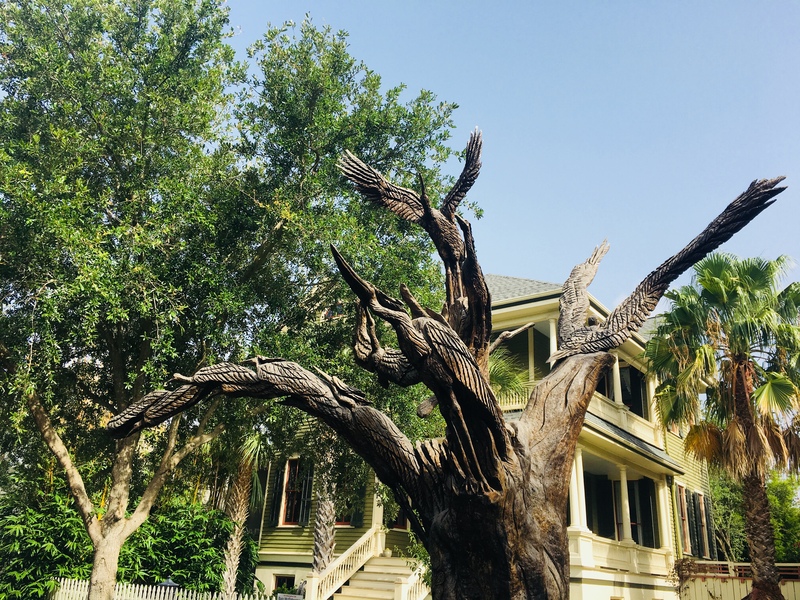 Download the Galveston Tree Sculpture Tour map HERE and find the route to walk or drive and learn the story behind each sculpture. 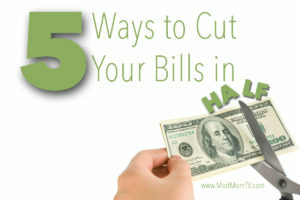 On most vacations, our biggest expense is usually eating out. 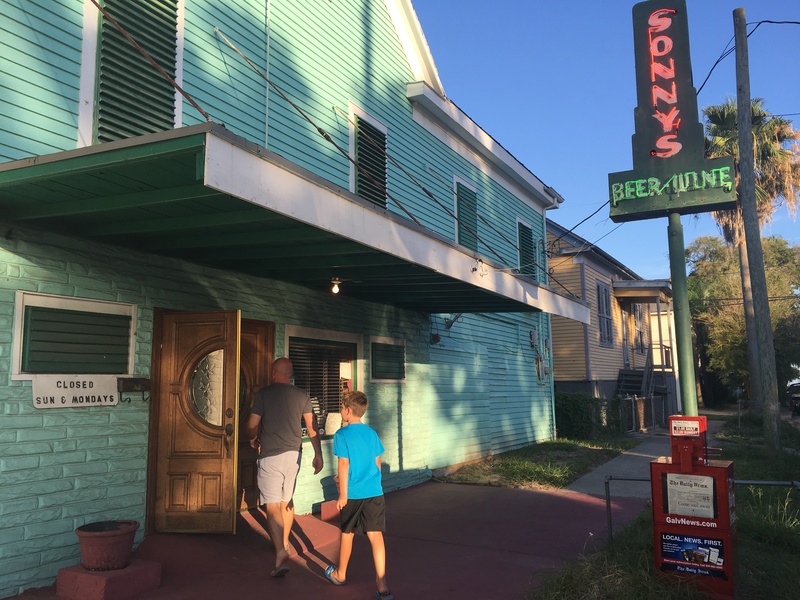 And since Galveston doesn’t have many Groupon options, we relied heavily on reviews from Google Maps to determine where we ate. 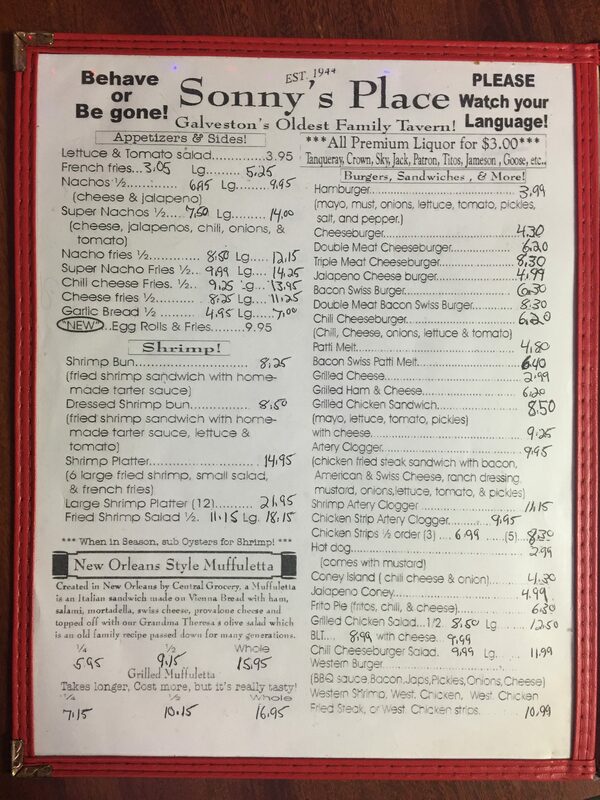 On our first night, we chose Sonny’s Place based on the these reviews. It’s off the main strip, family-owed and affordable. This in an OLD building with low ceilings and plenty of history. It feels like a neighborhood pub because…well..it’s in the middle of a neighborhood. There was one downside to our visit — we had to wait 45 minutes for our food because they were very busy and supposedly had just lost one of their cooks (although one reviewer stated the same thing one month earlier). 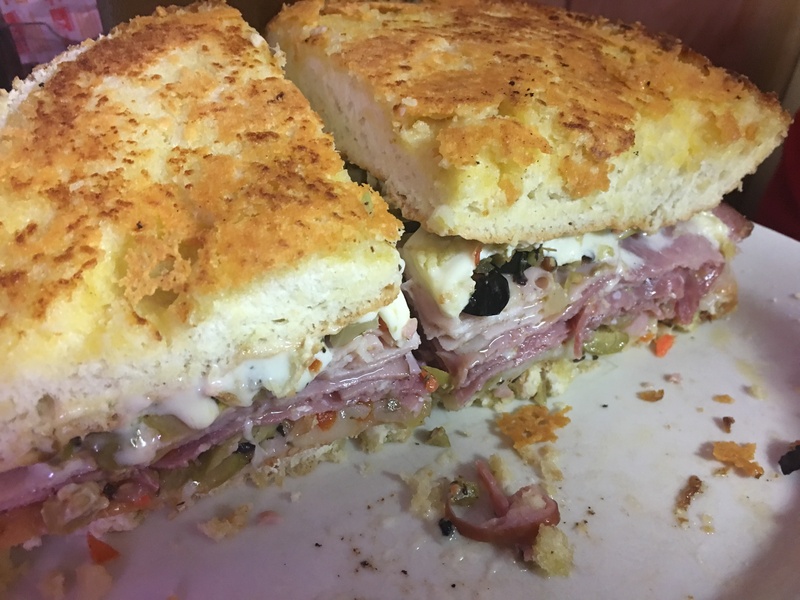 But take a look at this Grilled Muffuletta sandwich. It was SOOOO good. 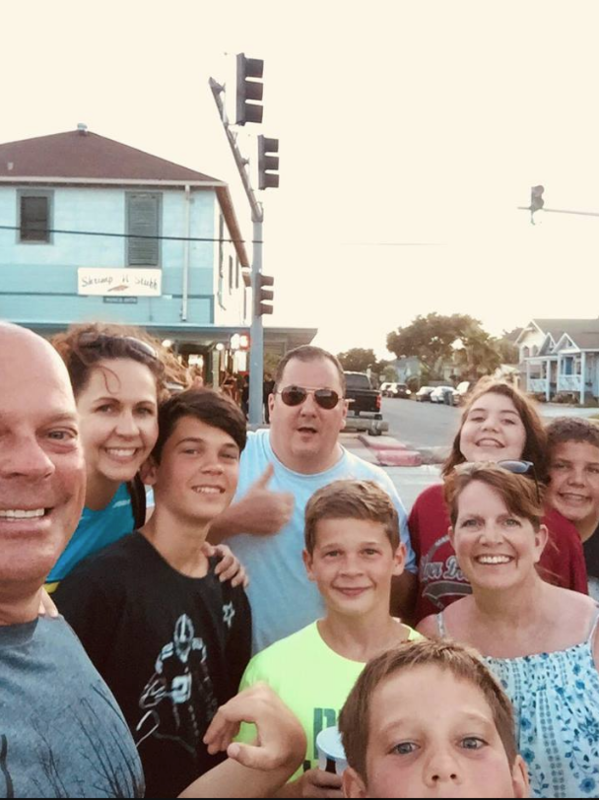 On the second night, my brother and his family joined us for dinner and we went to Shrimp and Stuff, once again based on prices and reviews from Google Maps. There was a line out the door, but reviews said the service was fast. And it was. Plus, the food was awesome! 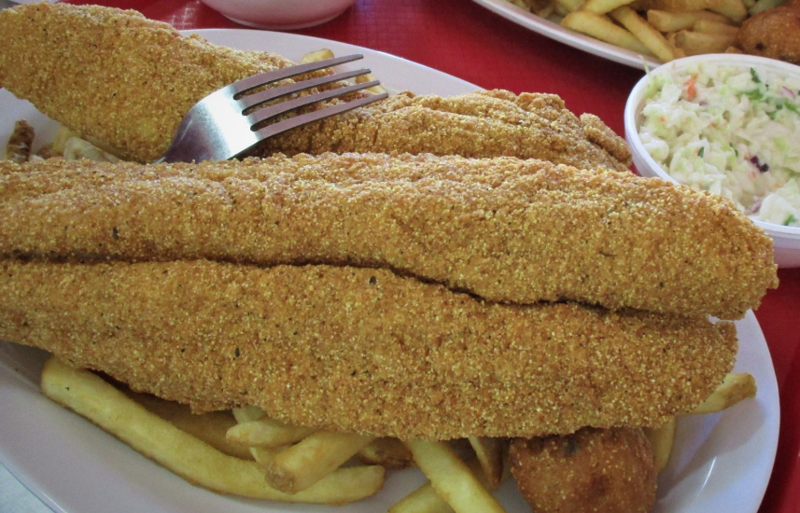 It’s typical fried seafood, so if you’re looking for healthy options this is not the place for you. And it was so good, we actually went back for dinner the next day! 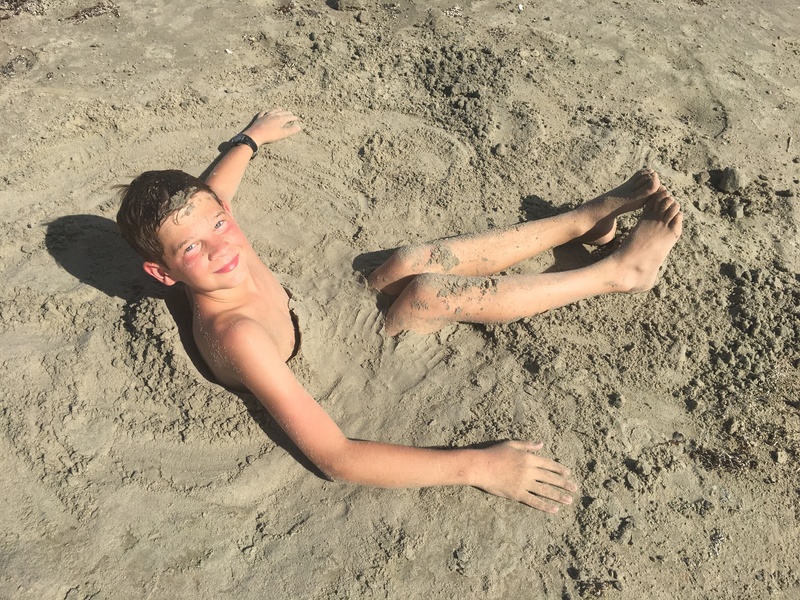 …and one who likes getting sand all up in his nether regions!!! 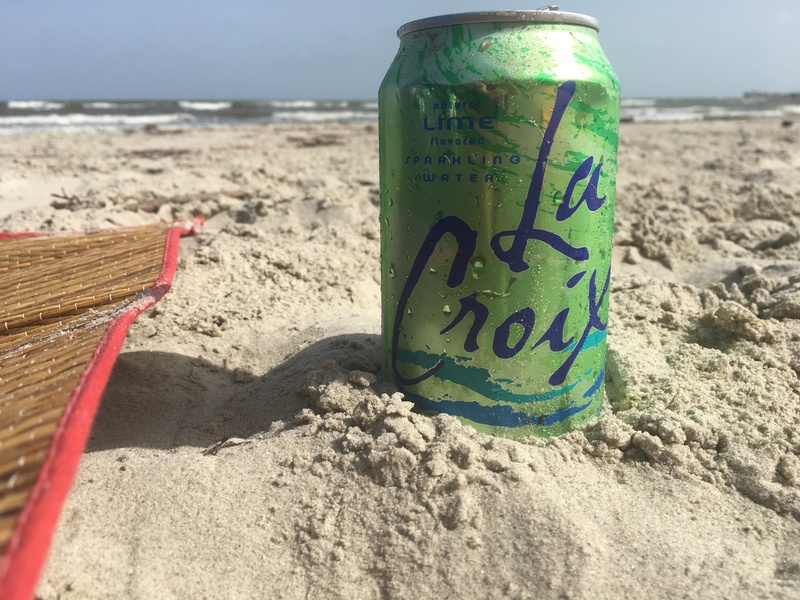 This post was NOT sponsored by La Croix. But it should’ve been. Our cooler was loaded down and I drank that stuff like it was….uh…water.